The FDA approved Zofran to help cancer patients with nausea after treatments or after surgery. But drugmaker GlaxoSmithKline (Glaxo) soon found other patients to take the drug – pregnant women suffering from morning sickness. There was just one problem. 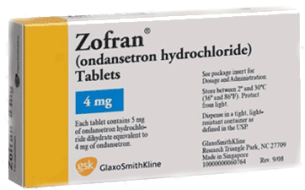 The FDA never approved Zofran for use by pregnant women. In 2012, Glaxo plead guilty to federal charges of fraud and illegal promotion of several drugs, including Zofran, and paid $3 billion as part of the legal settlement. Glaxo is going back to court to defend more specific allegations about Zofran (ondansetron), and drug manufacturers Novartis, Sandoz and Galena could face litigation too. Court documents show Glaxo knew as early as 1992 that Zofran presented “unreasonable risk of harm” to developing babies because the drug passes through the human placenta. Despite this knowledge, the manufacturer continued to market the drug to pregnant women. If you have had a child injured with birth defects, and you took a medication like Zofran prescribed to you during pregnancy, please call us for a free case evaluation. We look forward to helping you and your child.